The following quilts and blanket were seen in today’s video and have all now been donated to The Linus Connection. I share pattern links wherever possible. Garden Party blocks (made by me) plus two donated Stars for Linus! Pieced, quilted & bound by me. 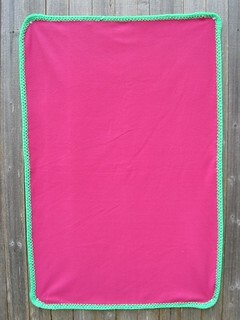 Fleece remnant with crochet edge. Sadly, I photographed the back side, so the edge isn’t as pretty! Tumbler quilt made from a kit at the last work day for The Linus Connection. 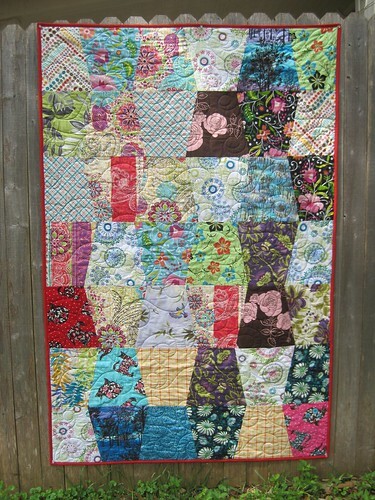 Quilted by Osie. Made from donated orphan blocks and Stars for Linus. 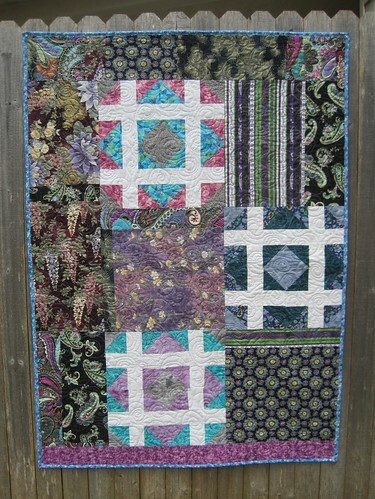 Pieced, quilted and bound by me. 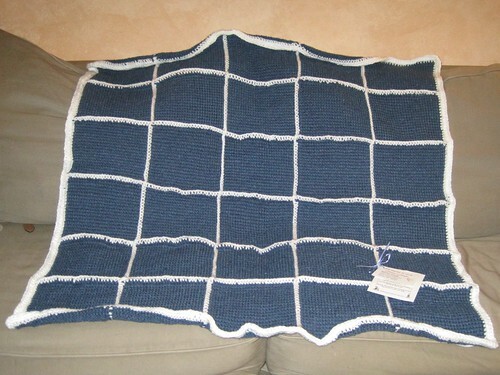 Made from donated orphan blocks with a few nine patches made by me to coordinate. Pieced, quilted and bound by me. Thanks to my friend Marge for the idea to use the black sashing! Made from donated orphan blocks and donated sales samples. Pieced, quilted & bound by me. A kit started by someone else, finished by me using fabrics I had on hand. Quilted and bound by me. 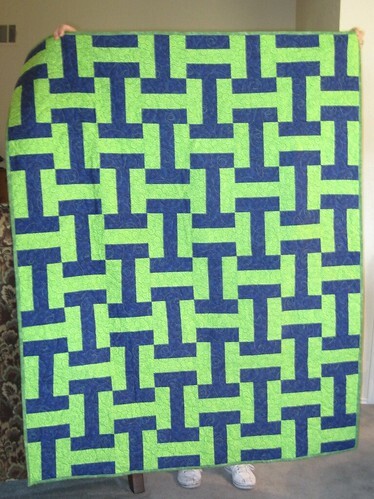 PoD Signature Quilt – Done! 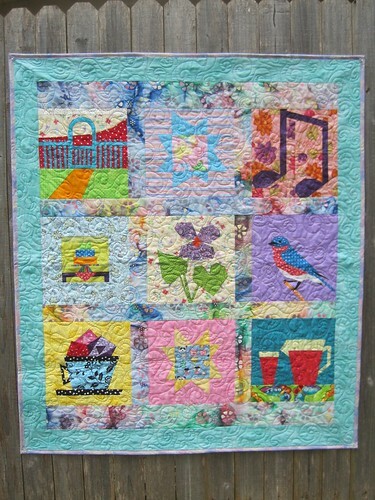 I totally forgot to mention that I have a pattern coming out in the next Quiltmaker’s 100 Blocks! Be sure to stop by Sewhooked on April 30 for a sneak peek and a chance to win fun prizes! This entry was posted in Finish It In '14!, talk to me tuesday, vlog and tagged 2014 to do, 2014 ufo, blanket charity, charity, donation, fmq, free-motion quilting, The Linus Connection, ttmt on April 22, 2014 by Jennifer Ofenstein. Today found me at yet another meeting for The Linus Connection. I’ve mentioned in the past that our numbers were low and that the continued shortage was weighing on myself and the other volunteers. Thanks to our very diligent volunteers and some serious recruiting, our numbers are back up again and we’ve even been able to set aside blankets for the camps we donate to each summer! I’d like to say a huge heartfelt thanks to all of my online friends that have donated to my favorite charity and encourage every crafty person out there to make something for a charity in your location. There are loads of organizations out there just like The Linus Connection that could use your crafty skills! Whether you knit a cap, crochet a scarf or make a quilt, whether you do it once a year or once a week, use your crafty skills for good and help change your world. Volunteering for a good cause pays in love and friendship. It’s one of the best non-paying jobs you’ll ever have! These blankets and quilts were donated through Go Get Granny & Log Cabins For Linus (aka, my online friends!). Thanks a million times to each of you for your time, your talent and your general all-around awesomeness! Quilt made by Shae, quilted by Marge. 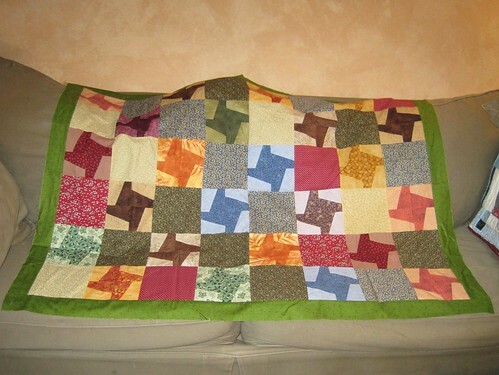 Quilt made with blocks donated by clumsy_chord, pieced by me (to be quilted). 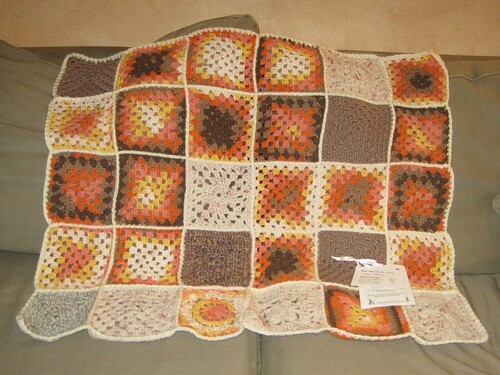 Afghan made from blocks donated by Janina, joined and bordered by me. Afghan made from blocks donated by craftylilthing in Starknuts colors. Joined by me. 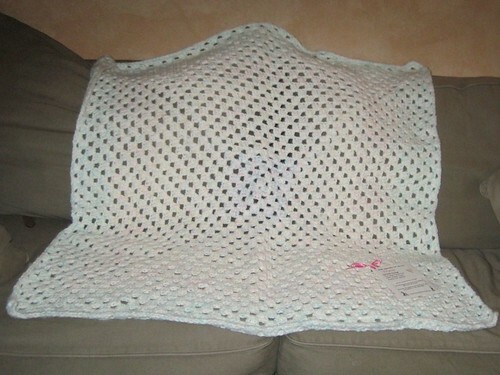 Afghan made with blocks donated by auntypsycho, joined by me. 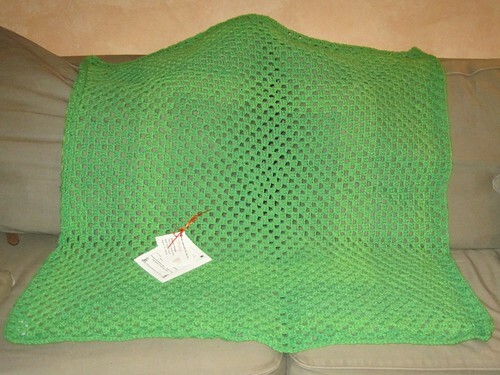 Fleece blanket with crochet edges, made by Jennifer Tanner. 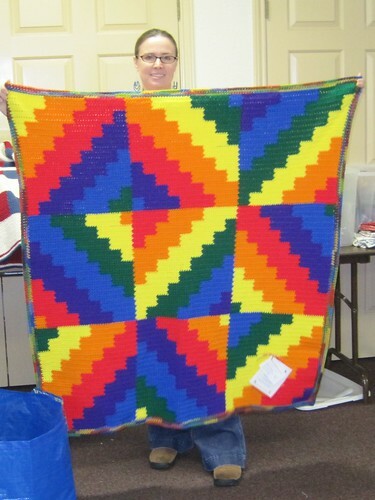 See more great blankets from Show & Tell at today’s meeting! I will continue to accept donations until the end of March, so just a couple more weeks now! If you still have something you’d like to share with Linus, please contact me for my mailing address. This entry was posted in charity, The Linus Connection and tagged austin, blankets, craft community, crochet, donation, generosity, knit, linus connection, quilt on March 20, 2010 by Jennifer Ofenstein. If you’ve missed it on my last few TTMT videos, Log Cabins for Linus and Go Get Granny has been wildly successful! This past Saturday, the first donations from around the world went out to kids all over the Austin area (read the Linus Blog here). 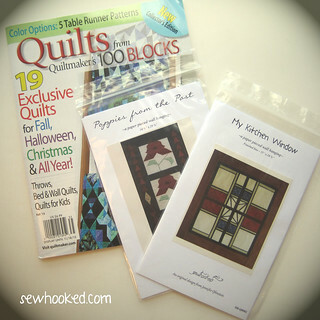 Many of the the wonderful online crafters that have been participating have sent individual quilt and crochet blocks, but I’ve also received completed quilt tops and entire afghans, fabric yardage and yarn! Made by Mary. 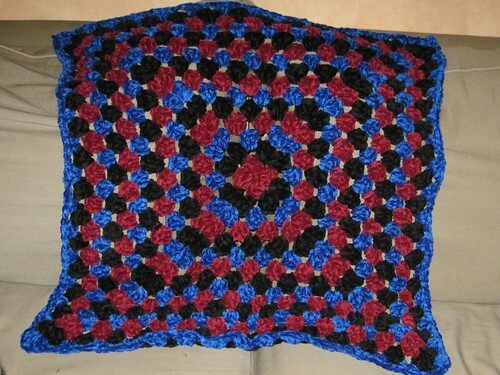 Mary also sent oodles of granny squares which are currently being turned into afghans. She also participating in the Starknuts Community blanket. made by Marissa from my Oh Wavy Baby pattern! 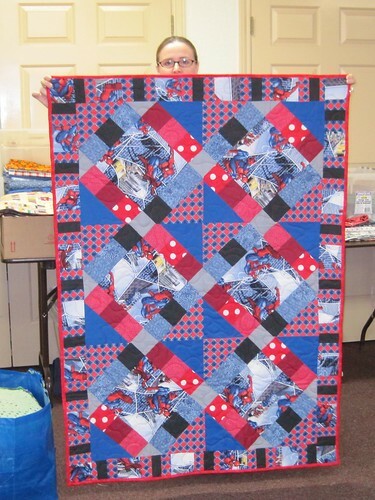 Marissa also made a Spiderman quilt, which you can see below. Made (and designed!) 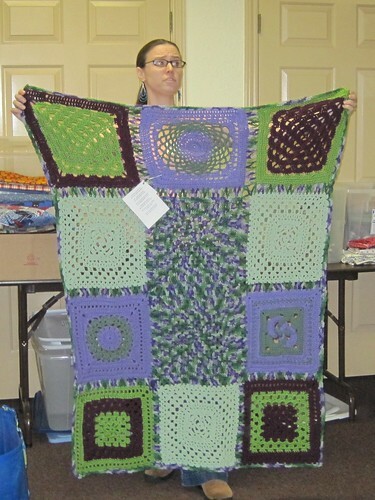 by Amber of Amber’s Originals, one of three teen-sized afghans she donated! Donated by Cat, from Australia! The following are photos taken by my good friend Linda during Show & Tell at Linus this past Saturday. That’s me holding up the blankets! 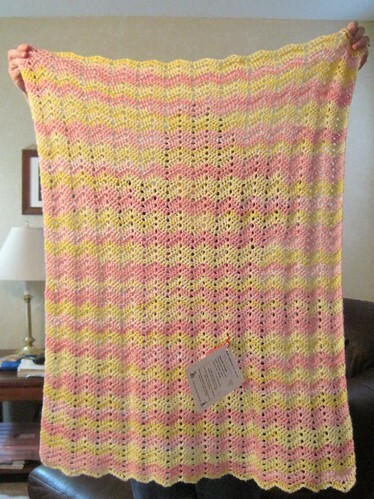 Another beautiful afghan by Amber of Amber’s Originals. made by Marissa…do you see Spiderman? 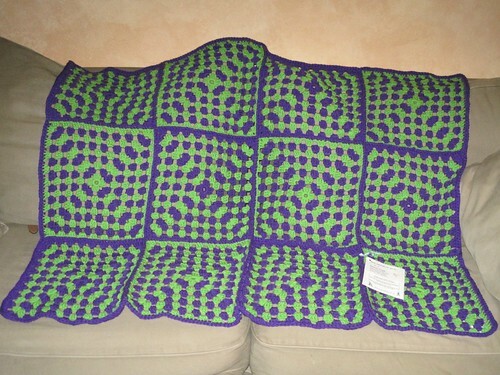 The Starknuts Community Blanket. You can read more about this one here. And no, I have no explanation for the look on my face! Top donated by Laci of Orange Blossom Boutique. This one will be quilted and go out with next month’s deliveries. 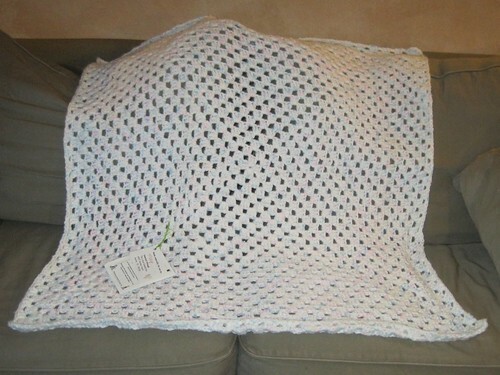 Each blanket receives a stitch on label, so the child that receives it will know just where it came from. There’s also a paper label that includes the first name of the blanket maker as well as a poem about the making of the blanket. 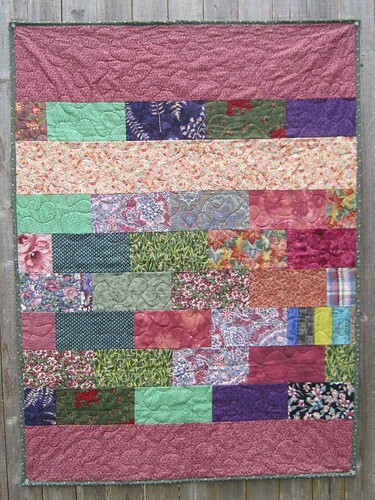 This month’s challenge for me will be to start turning the individual blocks received into quilt tops. I will likely quilt those myself, the sooner to have them go out to kids in need. 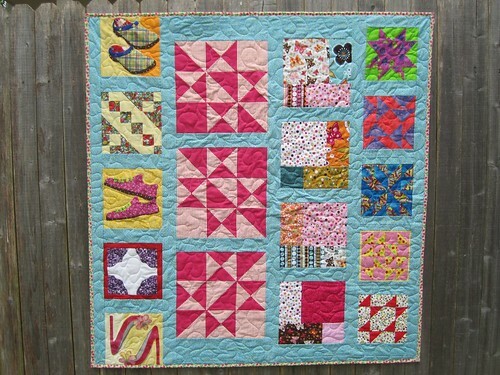 Shae, your quilt top is still at the quilters and I will post photos as soon as I can! We were still short on larger blankets because so many of the facilities that we donate to request them, but the numbers were better than last month, in part thanks to my wonderful online friends and the crafting community! I have HUGE hugs for every single one of you…someday! I will continue to accept donations until the end of March. If you still have something you’d like to share with Linus, please contact me for my mailing address. 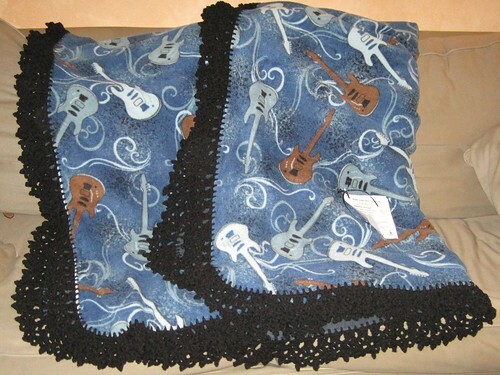 This entry was posted in charity, quilting, The Linus Connection and tagged austin, blankets, craft community, crochet, donation, generosity, knit, linus connection, quilt on February 22, 2010 by Jennifer Ofenstein. For many years now, I’ve been a volunteer for The Linus Connection*, a small local non-profit charity that makes blankets for children in need in Central Texas. I’m a blanket maker, sorter and volunteer Webmistress for linusconnection.org. I’ve served a term on the Board, and was the newsletter editor for a time. Suffice it to say, Linus is very important to me! Just as many other charities are suffering due to the current economy, Linus is suffering, too. Our demand has risen, while the number of blankets has decreased. When our numbers decrease, that means children that need a little extra security in a difficult time are going without. It’s a very hard call to decide who doesn’t get the security of a handmade blanket. 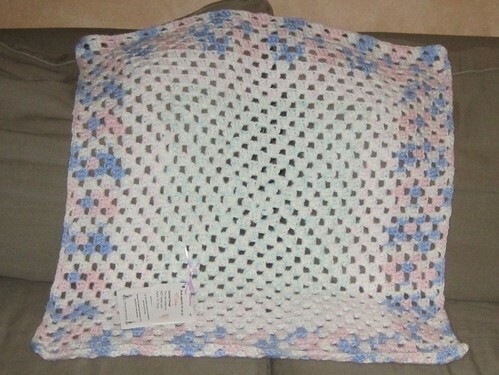 If I had my way, every child touched by severe illness, injury, abuse, homelessness or other crisis situations would know the comfort and love of a handmade blanket. My blog is a place I share my ideas, patterns, recipes and tutorials with the world for no charge, but this time I’d like to ask for a little something back. 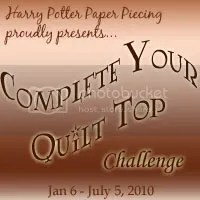 Throughout 2010, I will be collecting quilt blocks and yarn squares through my craft blog to assemble into Linus blankets. 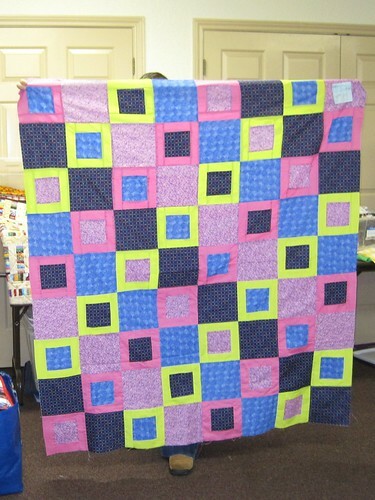 If you are a quilter, please consider participating in Log Cabins for Linus! 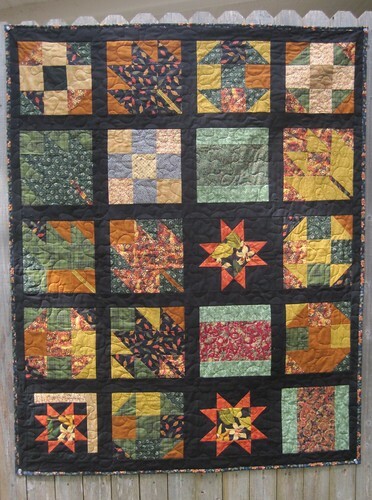 Make 12″ log cabin blocks (12.5″ unfinished) in 100% quilting cotton of any log cabin pattern, any color, any style you like. If yarn is your forte, then Go Get Granny is for you! 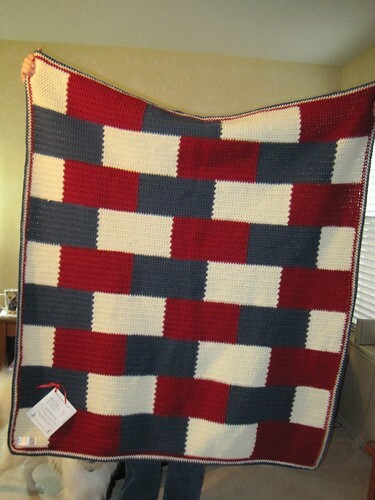 I’ll be accepting 12″ knit or crochet blocks made in acrylic yarns of any color or style and will join those into afghans. If you belong to ravelry, be sure and surf their pattern directory for lots of great ideas! When you’re ready to send your block, email me for my mailing address and I’ll send it your way. Donations to The Linus Connection are tax deductible, so if you need a receipt, please include a note with your block and I’ll make sure one gets to you. All blocks donated will be shared here on the sewhooked blog and on Talk To Me Tuesday as completed blankets before being donated to The Linus Connection. I encourage you to post photos of your blocks to the Go Get Granny & Log Cabins for Linus flickr group. 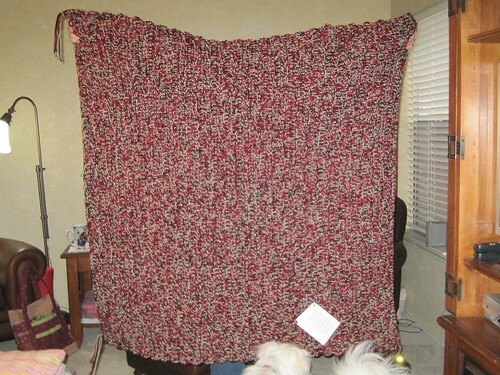 You can also see blankets I’ve donated since 2002. Anything you can do is greatly appreciated. For more information about The Linus Connection, please visit our website or blog or become a fan on Facebook. Disclaimer: This is my effort to increase blanket numbers for my own favorite blanket making charity, The Linus Connection, located in Austin, Texas. This effort is not in any way organized by TLC. All blankets will be donated to The Linus Connection by me, Jennifer Ofenstein. If you have any questions please contact me or leave a question in the comments. 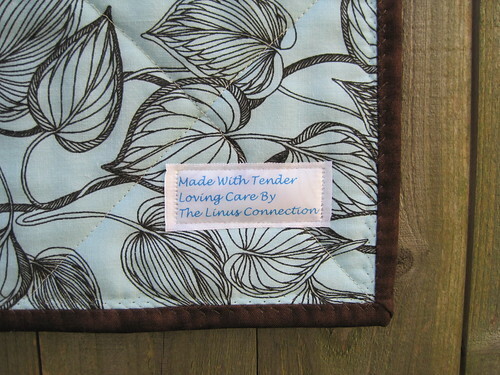 *The Linus Connection is a small, local non-profit located in Central Texas and is not affiliated with Project Linus. This entry was posted in charity, hand crafts, The Linus Connection and tagged 12" blocks, 12" squares, charity, crochet, donation, knit, quilt, quilt block, quilt square, The Linus Connection, yarn on January 17, 2010 by Jennifer Ofenstein. The awesome organizers over at help_haiti on Livejournal have found a great way to get fandom (all fandoms!) involved in raising money for charity while getting fun stuff in return. Crafters, graphic artist, writers and all sorts of other awesome people are donating their time and talents in return for charitable donations. You can bid in the comments of the item you’re interested in and once the auction is closed on noon (EST) January 20, 2010, the items will be paid for by donating to charity! Share your receipt and get awesome goodness in return. The charities win and you win, too! 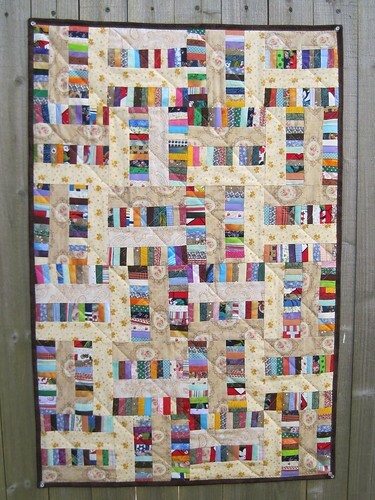 I’m offering up one Custom Designed 5″ Paper Pieced Quilt Pattern. You can read the full details here. Be sure to bid in the comments at this link. I cannot accept bids here. 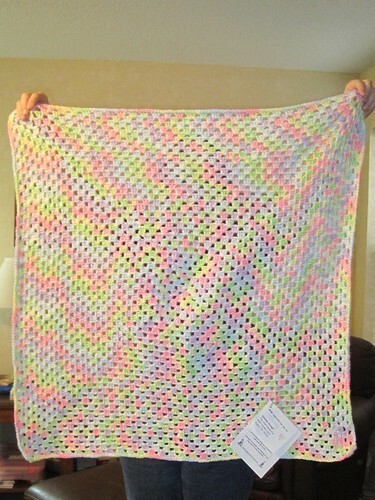 Amber (hp5freak) is auctioning off a 3’x3′ custom crochet blanket. She makes gorgeous and unique HP-themed blankets. You can see those here. Mary (dragonsinger954) is the maker of many a fine Molly Weasley sweater. She’s offering a custom-made one up right here. You can see examples of her many lovely Molly sweaters here. Also, the Queen of The Leaky Cauldron herself is auctioning off one autographed copy of Harry, A History. It’s a good thing, too, because you can’t have mine! Happy bidding and thanks for supporting this wonderful cause! This entry was posted in charity, doctor who, Fandoms, harry potter, Star Trek, Torchwood, twilight and tagged auction, charity, crafts, donation, fandom, haiti, harry potter, help_haiti on January 16, 2010 by Jennifer Ofenstein.